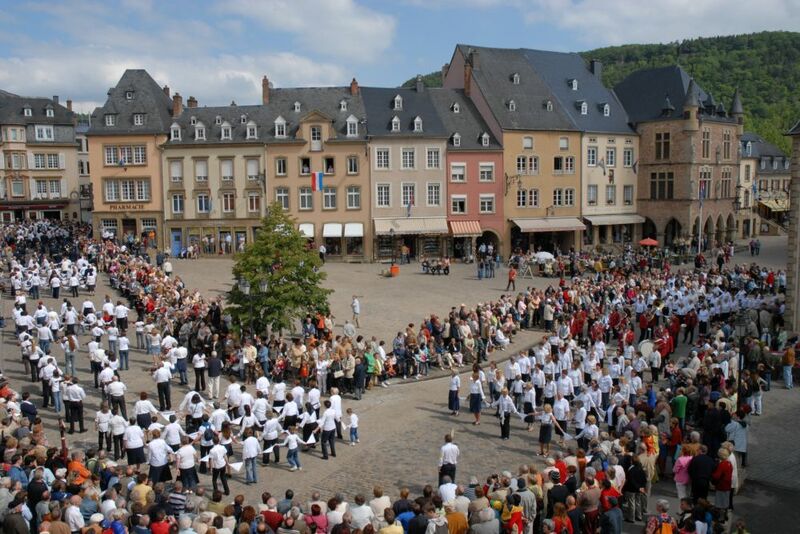 Echternach, already famous for its Benedictine abbey founded by St. Willibrord (698), which experienced its days of splendour in the Middle Ages thanks to its gold illumination studios, owes its world renown to its or Hopping Procession. Every year on Whit Tuesday, thousands of pilgrims and spectators gather to participate in this unique cultural phenomenon in honour of the abbey’s founder. 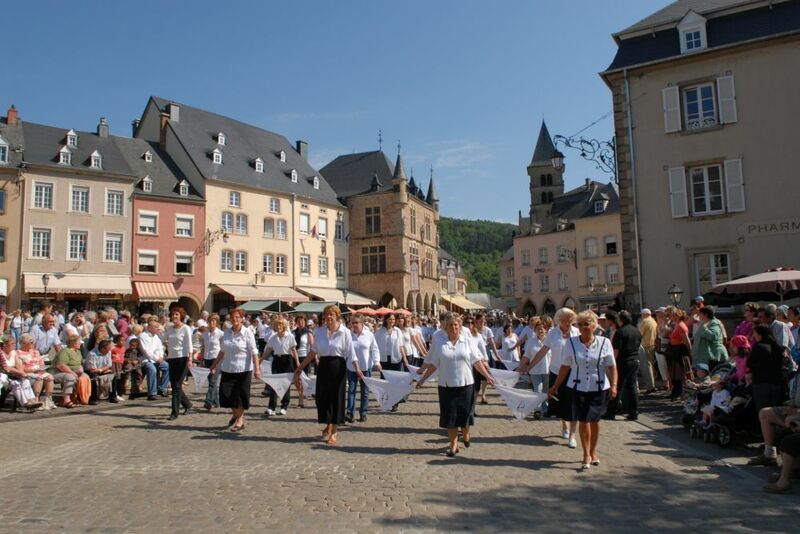 The procession takes them to the tomb of the patron saint located in the crypt of the papal basilica in the heart of the abbey city of Echternach. But what exactly is a hopping procession? 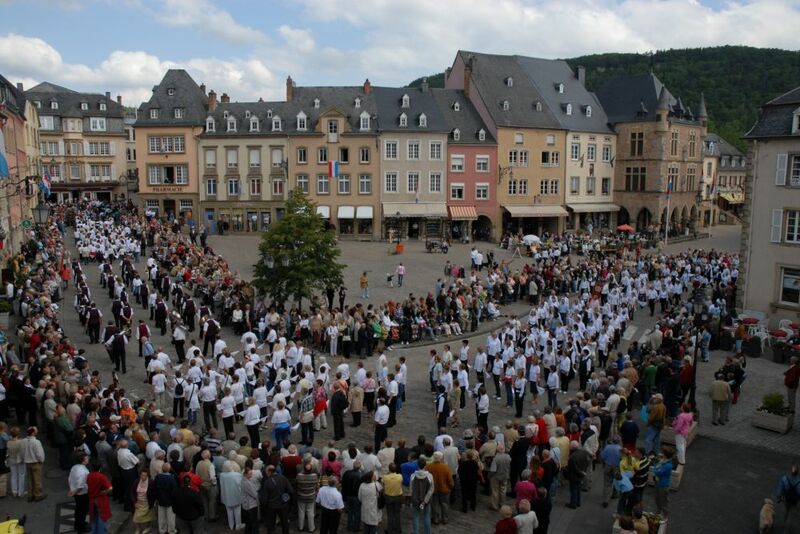 The first time that Echternach was mentioned in history books was with the arrival of the monk Willibrord in 698. 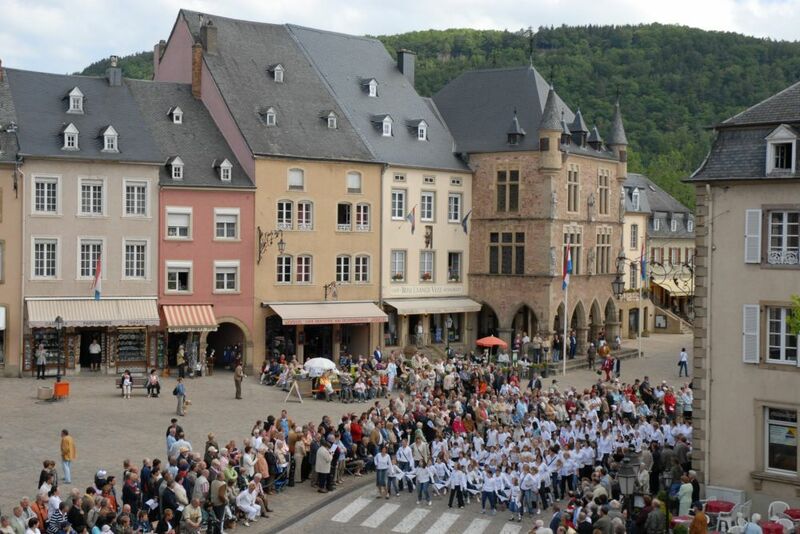 He built a new church and a monastery and spent his final years in Echternach. After his death in the 8th century, he was buried in the church built by himself. Soon after his death, pilgrims started to arrive to hear the miracles which had happened at his tomb. As more and more pilgrims arrived in Echternach the church had to be enlarged and his tomb had to be placed in the centre of the choir. The first written reference of the hopping saints goes back to 1497 but as it refers to something quite routine, the origins must be from much earlier. 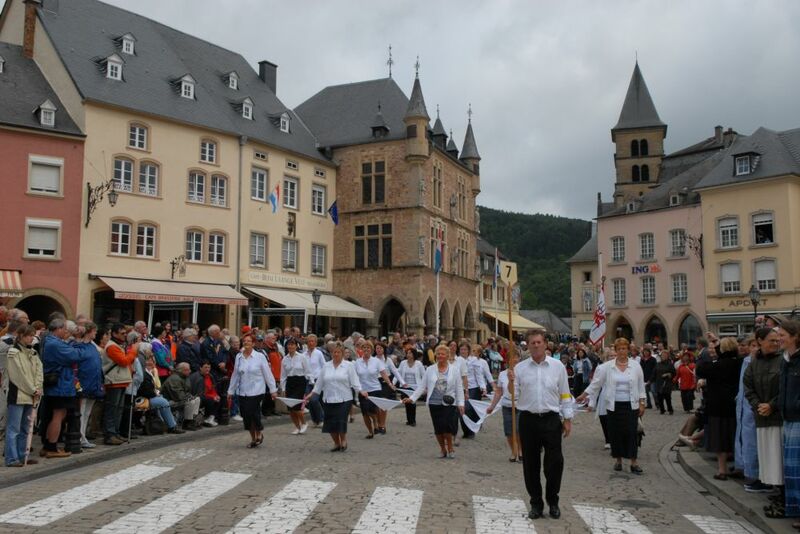 The source of this particular custom goes back to the 16th century, when male pilgrims from Waxweiler started performing a hopping dance on the way to Echternach to present their offerings for the Whitsuntide holidays. 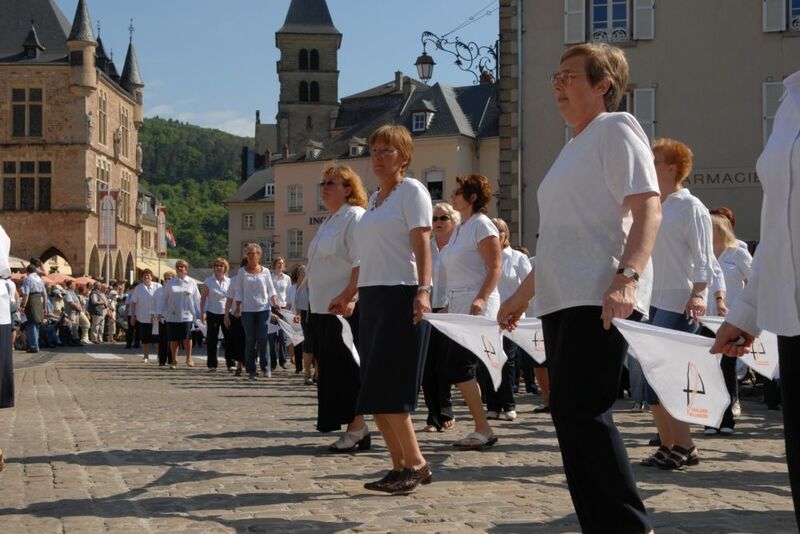 Only since the end of the 18th century, the procession has been open to women as well. 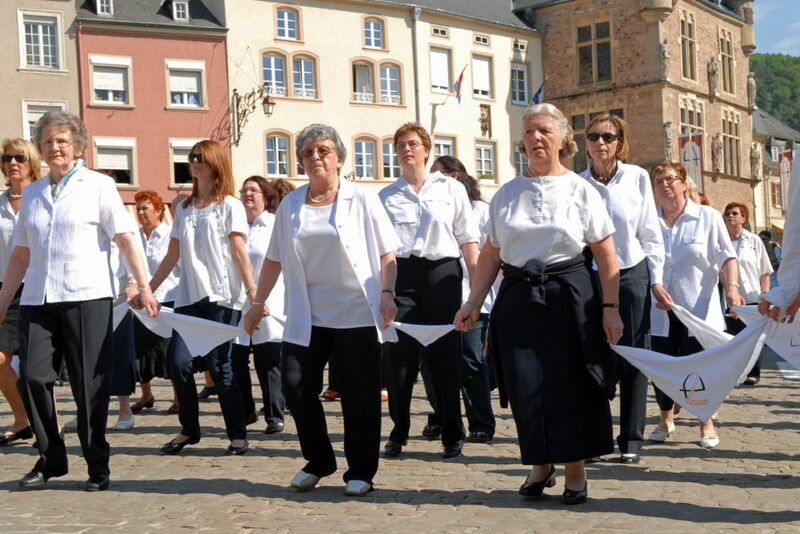 Nowadays, musicians, prelates, abbots, bishops and 9.000 pilgrims from all over Europe, mostly dressed in white shirts and dark trousers, hop to a polka melody through the medieval streets of Echternach to the crypt past St. Willibrord’s tomb. The hopping step is sideways and forward. 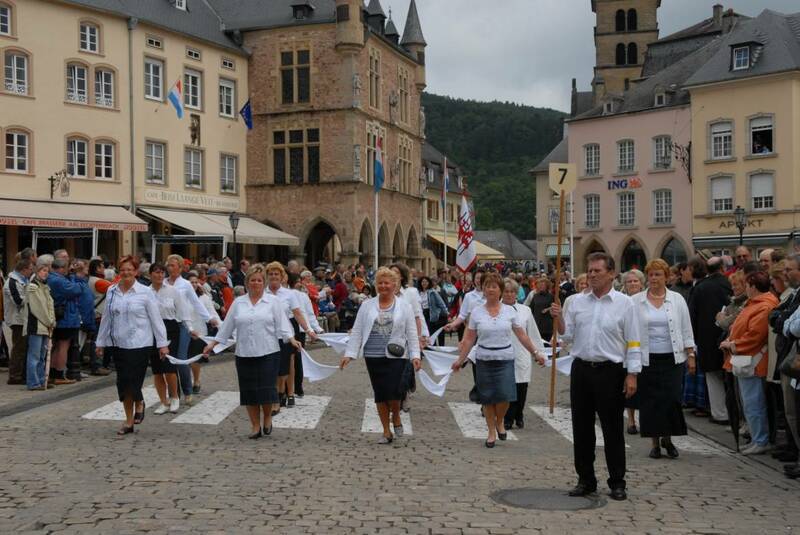 As you have to hop on the spot during a halt, some people thought that the procession was drifting backwards and forward, which is why some believed this to be the original dancing form and why some groups started hopping this way in the 19th century until it was banned during the Second World War. Since 1945, the original sideways and forward step has been in use again. The purpose of the procession can be seen as an expression of joy or a prayer: a form of communication between man and God which involves body and spirit. It may also be seen as a sign of human joy, inspired by the love of God. To find out what it means for you, try it out! This special event was recognized as Intangible Heritage by the UNESCO in 2010. In the museum of the baroque abbey, the information and documentation centre of the hopping procession, and the lapidary museum, visitors and pilgrims can see the distinctive features of the basilica, the abbey, its scriptorium and the procession whose origins have been lost in the mists of time.